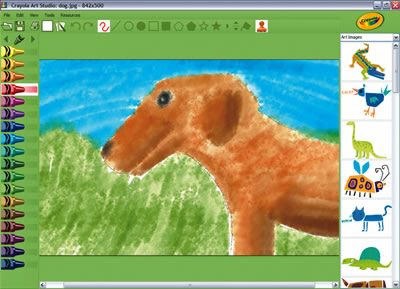 If your kids love the computer as much as mine do (begging would be an appropriate word to insert here) and they happen to be a little crazy about art, then you might want to look into purchasing Core Learning's new Crayola Art Studio ($24.95). It was just released in November and is a wonderful program for kids to create their own works of art. The program is based on the beginner levels of the corefx digital art software. 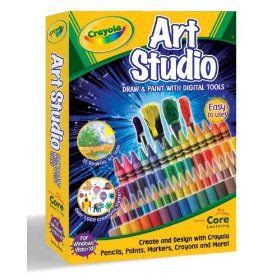 realistic art tools to use - crayons, markers, paint, watercolors, chalk, oils...all available in a variety of colors and strokes. If you have older children, the Corefx program ($59.95) allows you to do even more with graphics and drawing and even animation. Corefx includes many more graphics and art mediums and also has three skill levels. In addition to art, Core Learning also offers programs for math, health, language, and critical thinking. We've been using the Health for Kids Series ($29.95) and our girls are having a lot of fun exploring the insides of the human body. The program makes it extremely fun for kids to learn about different parts of the human body through animation: the tongue, larynx, airways, mouth, epiglottis and more. Core Learning also has a special page that lists current promotions available. Be sure to check out the Homeschool Crew blog for more on Core Learning!